On the simplest level, a resource (a person, a piece of equipment, or a material) is created as a single entity — a particular person or a meeting room or a piece of equipment. You create the resource by entering information in the Resource Information dialog box. When you create a resource, you must type, at minimum, the resource name, though you can also add as much information as you want. Some people prefer to create all the resources first and add contact and cost information later. Click the bottom of the Gantt Chart button on the Task tab of the Ribbon, and click Resource Sheet. Double-click a blank cell in the Resource Name column. You can also click the Information button in the Properties group on the Resource tab. Type a name in the Resource Name text box. Click the down arrow in the Type box (on the right) to choose Work, Material, or Cost. The settings that are available to you differ slightly, depending on which option you choose. For example, a material resource has neither the Email nor Logon Account option, and a work resource or cost resource has no Material Label option. For a material resource, enter a description of the units in the Material Label field. For example, you might enter pounds for a Flour resource or tons for a Steel resource. In the Initials field, type an abbreviation or initials for the resource. If you don’t enter anything, the first letter of the resource name is inserted when you save the resource. Continue to enter any information you want to include about the resource. This information may include an e-mail address, the group type (a department, division, or workgroup, for example), booking type (proposed or committed), or code (such as a cost-center code). If you enter information in the Group field, you can then use the Filter, Sort, and Group By features to look at sets of resources. Click the OK button to save the new resource. 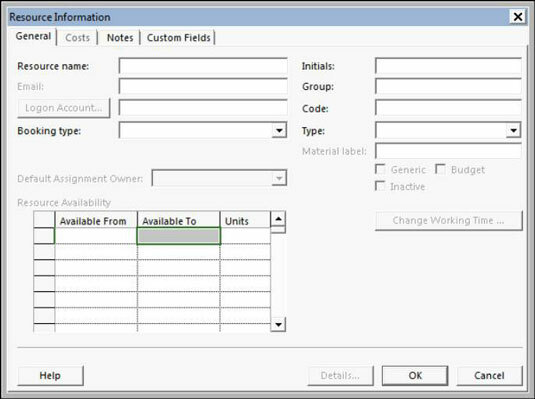 To enter information about several resources at a time, display Resource Sheet view and enter information in the columns. You can even paste resources copied from another source (such as an Excel spreadsheet) into this view.